A pair of grimy 48 class diesels with a load of wheat wagons trundle through Wattle Flat. Wattle Flat is a fictitious town located in the Northern Rivers region of New South Wales. 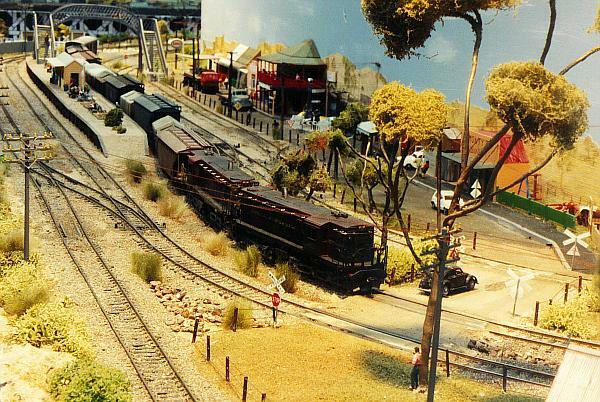 The North Coast line of the NSW Government Railways runs through the town but the area is also served by the fictitious and privately owned railway, the Brunswick & Northern Rivers Railway (BNR). The BNR owns its own locomotives and rolling stock, many purchased second-hand from other railways. Much rail traffic is generated in the Wattle Flat area, including passenger services, and goods traffic for the local industries and the sheep and dairy farming in the area. Wattle Flat measures 3 metres x 3 metres (9'10" x 9'10") and was the first layout constructed by the GMRG. The layout was exhibited from 1990 to 1992 before retiring permanently from public viewing.